Chocolate lava cakes are new territory for Amanda Faber. 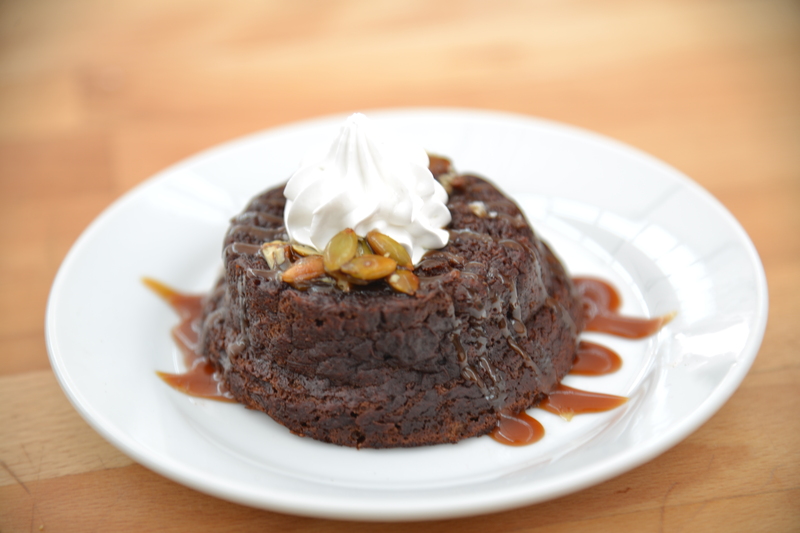 She focuses on flavor for her signature bake in which she makes Hot Chocolate Lava cakes. The spicy chocolate sponge is flavored with cayenne pepper and cumin and topped with a lime marshmallow cream. The smoke and heat of the spices in her sponge were inspired by actual lava. This is a new combination for the judges. Watch the full episode of "Chocolate Week" from Season 2 Episode 5 of The Great American Baking Show to see how the judges rate Amanda's bake. 1. Combine water and sugar in a sauce pan over medium-high heat. 2. Stir with a small spoon only until the sugar has dissolved. Then, swirl the pan occasionally. 3. When the sugar mixture turns amber, remove from heat and add heavy whipping cream. 4. Stir with a wooden spoon until combined, then add salt. Stir again. 5. Return to a medium heat and cook until slightly thickened. 6. Pour in to a bowl, set aside to cool. 7. Once cool enough pour in to a squeeze bottle to garnish the cakes. 1. Melt butter in a sauté pan over medium heat. 2. Stir in the pepitas. Stir and toast for about 2 minutes, until fragrant. 3. Add honey. Coat the seeds and cook for about 1 minute, until toasted and a couple of pops can be heard. 4. Spread out on a plate to cool. 1. Combine lime juice, sugar, and corn syrup in a sauté pan over medium-high heat. 2. In the bowl of a stand mixer, whip up the egg whites and cream of tartar to soft peaks. 3. Once the syrup reaches 240° F/116° C, remove from heat and slowly pour in to the egg whites while the mixer is running. 4. Whip until thick and glossy, up to 7 minutes. 5. Add in the vanilla and lime zest. 1. Heat the oven to 450° F/232° C.
2. Butter ramekins. Coat butter with cocoa powder. Tap out the excess. 3. Place the ramekins on a jelly-roll pan. Set aside. 4. Over a bain-marie, melt the butter and both chocolates. 5. While the chocolate melts, whisk together the eggs and egg yolks in a stand mixer. 6. Slowly add the sugar in to the eggs. 7. Turn the mixer on high and whip until thickened and light in color. 8. Add the flour, cayenne pepper, and cumin to the egg mixture. Mix until just combined. 9. Stir the chocolate and butter until smooth. 10. Add the chocolate mixture to the rest of the ingredients. Mix until just combined. 11. With a scoop, evenly fill each ramekin with batter to just below the interior ridge. 12. Bake until the sides are set and the center is jiggly. The tops should be barely not wet. ~7-12 minutes. 13. When done baking, invert one at a time on to a serving plate. Once they are all inverted remove the ramekin from each cake. 1. Plate the lava cakes. 3. Sprinkle with pumpkin seeds.